Another quick theme, not too different from Wheels but just experimenting again with opening the shared document spaces within an iFrame to keep Navigation obvious. Again, I haven’t included the Statistics or Chat features in this theme and it’s intended to be used with h5ai styling installed. 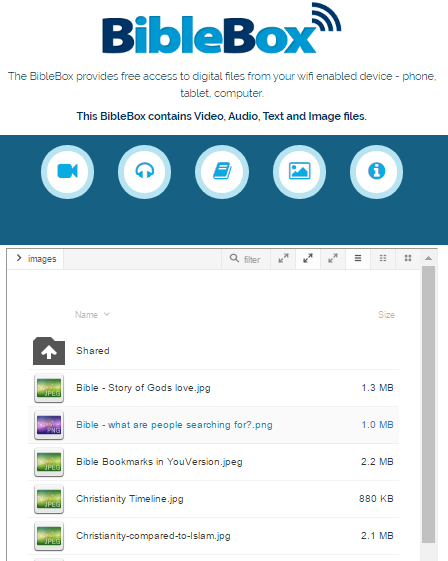 After getting a burst of enthusiasm from talking to good mate Pete Higham I jumped in and setup a new theme for the BibleBox. Titled Wheels-2017, its a simple clean theme designed for use with h5ai styling and mobile devices primarily. I haven’t included the Statistics or Chat features in this theme. I’m not convinced that the Chat feature is really used and the info from statistics while interesting at first usually becomes less important. I’m also creating another theme so watch this space. Thanks to Marty Lange here’s a quick video showing you the process of connecting your android phone to a BibleBox to download and access resources over wifi.